Iowa has some of the best-quality cosmetology schools in the country thanks to their education requirements and impressive school options. Check with your high school to see if you can take cosmetology classes and maybe even get your course for free. If you’re a fan of staying on top of the latest beauty trends, and you love making people feel comfortable, beautiful, and excited about their look, a career as a cosmetologist can be a rewarding way to earn a living, work flexible hours, and can even open doors to building your own business. And it all begins with getting your license! Iowa schools that teach cosmetology are required to include at least 2100 hours of instructions (source) in makeup, hair care and treatment, and skin care. This on the high end of the required hours in the U.S. At California beauty schools, for instance, students need only complete 1,600 hours. You’ll be taking classes in acrylic nails, hair and scalp treatments, facials, makeup application, and more. You’ll also have the opportunity to learn career management skills, and how to grow your own business and build a customer base. Beauty college is a fantastic adventure that can lead to plenty of rewards, and the training is not long and burdensome if you’re passionate about it! Once you have completed your studies, you’ll need to plan for your exams. Iowa cosmetologists must pass the National Interstate Council exam. You can apply online, and you must pass both the written and the theory exams with 75% or higher in order to qualify for licensing. If you are currently holding a license in good standing in another state, but are relocating to Iowa, you will need to apply for a license by endorsement. You will need a notarized copy of your passing NIC theory exam, and letter of verification of licensure sent directed to the Iowa board of cosmetology, and proof that you are currently holding a cosmetology license in another state for at least 12 months of the previous two years. Your Iowa license needs to be renewed every other year by March 31st. You’ll receive a renewal notice in the mail. 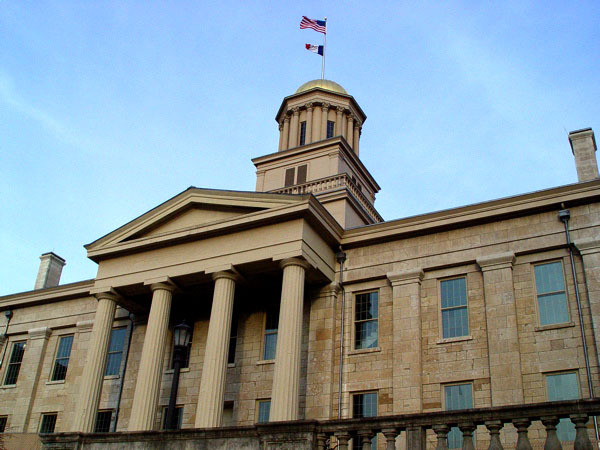 Iowa has a continuing education requirement of eight hours or 8 credits per licensing period. Check with the board for specific requirements of your education credits, but at least half of the eight hours should be spent in cosmetology courses, and two hours should be spent on Iowa rules and regulations and an update of sanitation and safety requirements. Your career in cosmetology will likely start in one of the many salons. You can grow a client base by renting a chair, or take on a job within an existing company to grow your skills. However you choose to get started, an Iowa job search can help you learn about your options and give you an idea about expected salary. Other Iowa schools for makeup artists, estheticians, nail techs and barbers. Did we miss any beauty schools in Iowa in this list. Please let us know.